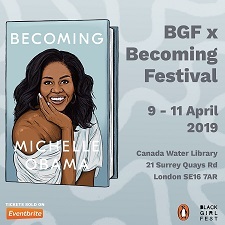 Penguin is building on the success of Michelle Obama's autobiography Becoming by partnering Black Girl Festival to launch BGF X Becoming Festival. The festival will run from 9 to 11 April, aimed at ages 11 and upwards. It will offer poster-making workshops, bite-size history lessons on Black British feminism, creative writing workshops, and in conversations between rising stars within the creative industries. Further details will be announced soon. Black Girl Festival is an arts and cultural festival celebrating Black British women and girls. Founded by Paula Akpan and Nicole Crentsil in 2017, the festival celebrates and champions Black women through talks, workshops and masterclasses. Michelle Obama is to be interviewed by Stephen Colbert at the 02 Arena in London on Sunday 14 April. The event is part of her international book tour, "Becoming: An Intimate Conversation with Michelle Obama", which will also include events in Copenhagen, Stockholm, Oslo, Amsterdam and Paris, as well as multiple stops across the US and Canada. The hardback edition of Becoming has over 8.25 million copies in print worldwide. Tickets to BGF X Becoming Festival are free, but RSVP is essential due to limited places. Further information here.